China's lead climate change negotiator has said he was keeping an "open attitude" as to whether global warming was man-made or due to natural cycles. Xie Zhenhua said climate warming was a "solid fact" and that mainstream scientific opinion held it was due to emissions of gases such as CO2. 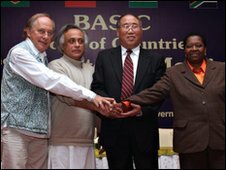 He was speaking in Delhi at a meeting of envoys from Brazil, China, India and South Africa. They agreed to submit their plans to cut emissions by the end of January. The emission of carbon dioxide, from burning coal and other industrial processes, is one of the gases believed to be chiefly responsible for causing rising global temperatures. Mr Xie's comments appeared to surprise the other environment ministers and envoys at a news conference at the end of their two-day meeting. He said: "It is already a solid fact that the climate is warming. "There is one starkly different view, that the climate change or climate warming issue is caused by the cyclical element of nature itself. "I think we need to adopt an open attitude to the scientific research." He said that it was important to include as many views as possible "to be more scientific and to be more consistent". He was responding to a reporter's question about a controversy over the UN's climate science panel's 2007 assertion that Himalayan glaciers could disappear by 2035. A number of scientists have recently disputed the figure. The vice-chairman of the Intergovernmental Panel on Climate Change (IPCC) said last week that it was an error and would be reviewed. But the IPCC's vice-chairman Jean-Pascal van Ypersele said it did not change the broader picture of man-made climate change. Brazil, South Africa, India and China are some of the world's fastest-developing economies. Their greenhouse gas emissions are also among the fastest rising in the world. At their weekend gathering, the officials said they would announce by the end of the month their plans to cut emissions. They also agreed to contribute $10bn (£6.2bn) this year to help poor nations combat the effects of climate change. Brazil's Environment Minister Carols Minc said this would be "a slap in the face to the rich countries" who pledged at the Copenhagen climate summit in December to contribute $30bn (£18.5bn) in funding for the next three years and $100bn (£61.8bn) by 2020.